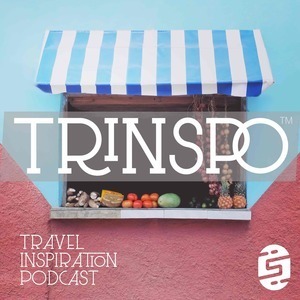 We found 10 episodes of Trinspo: Travel Inspiration with the tag “wanderlust”. Ben tells us about the time he lived and worked in Mexico, meeting Australians around the globe, important details that get lost in translation, and magical island scenery. Kathy discusses the art of attracting travel into your life, shares a spontaneous trip to Paris, inspiration from Cambodia, and the best age to start traveling. Episode 22: Have You Touched a Russian Bear? Golnaz tells us about a work trip to St. Petersburg, Russia, discusses the balance of work travel and life travel, and argues that the food around the world doesn't compare to home. Marie tells the story of her family's quest through Europe to discover places related to each of her four children's namesakes, discusses the blessings of strangers, and why it's a good idea to travel with children. Heather and James talk about cave discotecas, Cuban grocery stores, peso foods, technology in Cuba, and U.S.-Cuban relations. Frank imparts the life lessons he learned while finding his way across the Sinai Desert in search of ATMs and Cokes, only to find trash cities and a lighter load. Have you ever brought a musical instrument with you on a trip, just for fun? Jess has, and she's here to tell us all the reasons why it wasn't as idyllic of an experience as it sounds. Plus, prioritizing adventuring in life and the scams of Spanish homestays. Do people who have strong associations with place like traveling more than others? If you take all of the citizens of a city and move them to another city, will the personality of the original city remain? Sarah & Heather muse about travel and our psyches, and palm trees. If you're in another country without a passport, do you exist? Angélica and Heather talk about border crossings, the feelings of helplessness when stranded without a passport, and leaving life behind when going on a trip. Diana & Ken talk about how eye-opening it can be to travel where tourists don't go and experience local life. Plus, the pros and cons of owning a timeshare.